Strong and sedative great for pain relief and stress. Great tincture and edible strain reliefs nerve pain and aids in sleep. This slightly indica dominance variety of an average height with some large phenos will cause a relaxing high leading to sedative couch lock effects. Sangria plants produce outstanding yields and heavy dence burgundy clusters. The flavour is sharp grape bubblegum with red wines and a slight hint of alcohol like vodka with a light finish and aftertaste. 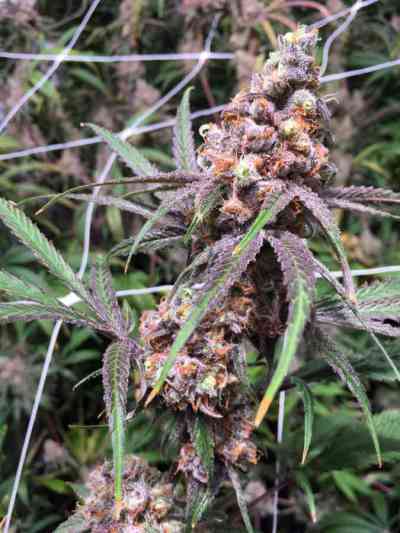 This colourful plant is an amazing resin producer with fairly fast flowering period of about 55-60 days. Created as a tribute to Subcool's time in the wine country, the flavor and rich purple colors of the mother combine perfectly with the solid structure of Querkle. Expect a rainbow of maroons and burgundy colors and a super strong Bubble Gum smell in about half the phenos. Sedative with couchlock tendencies.